Orchids seem to do best if a greenhouse is devoted solely to their cultivation, though some types such as Odontoglossum grande and Coelogyne cristata will succeed very well in a general collection of plants. At the outset, it is as well to consider the type of orchid collection you desire to grow or to provide for adding further sections of this large family. A general collection of orchids under one roof containing many species from widely differing habitats is perhaps the most satisfying type of collection. From it, you can gain a very broad understanding of the plants. The often wide temperature tolerance of many orchid species makes such a collection possible. Some may wish to establish a collection devoted to perhaps one genus, such as Cymbidium. The ideal method is to divide a small greenhouse into two sections, one for plants requiring cool conditions, the other for those needing warm conditions. If an existing house is being taken over for orchids, and it provides cool conditions only, a small area could be enclosed with heavy gauge polythene and a soil-warming cable installed. This would allow the growing of warm types in the enclosure and the cool-growing types could be kept in the main body of the house. The staging in the house should be of the double type, with a gap of about 16cm (6in) between the upper and lower stages. The upper stage can be of the open wood-slat type for placing the plants on and the under stage should be covered with gravel or ashes. This is referred to as the moisture staging and is frequently sprayed with water to keep up the humidity of the house. A gravel path which can be sprayed is also very useful for this purpose. The type of plant will determine if the staging should be flat or in steps. A wire framework placed on top of the stage, if shaped like a series of step-ladders, will house many more plants if they are hung on the frame. Thin metal rods attached to the main beams of the house just above the path but not over the stage will provide more space, and this system is ideal for the species that prefer more light and many of the smaller orchids. Ventilators should be preferably under the staging and in the roof. The ventilators found in many greenhouses in the upright glass sides of the house are not advisable for the orchid house because droughts are produced and excessive drying out will occur. There are many heating systems available to the orchid grower today. The once much-favored boiler-heated water pipes of 10cm (4in) diameter have many advantages including a considerable degree of control. Many efficient electrical systems with thermostatic control are much used and the greenhouse fan type of heater is especially suitable. Care should be taken to install a system capable of providing somewhat above the minimum winter temperature decided on for the particular section of the family grown. Paraffin heating is a controversial subject among orchid growers. Many use this form of heating to provide a supplementary source of heat on very cold winter nights and also for emergencies such as power cuts. Double glazing with polythene on the inner side of the glass can reduce heat loss and an increase in temperature of 5 degrees and more has been claimed with the use of double glazing. A diversity of plants can be managed quite successfully under one roof, because despite attempts to produce uniform conditions in a greenhouse, some parts will inevitably be that much warmer, brighter, or moister, and this with a little experimentation can be turned into a considerable asset. 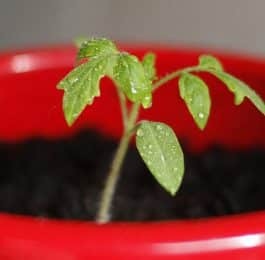 It is well known that with a plant that is reluctant to flower or a slow grower, improved results can be had by moving the plant about the house until it responds to a different environment. Ventilation The greater number of cultivated orchids require plenty of fresh air which is essential at all times, especially in the cool and intermediate sections of the orchid house. Besides providing an ample flow of air around the plants, ventilation is also used to help to regulate the temperature. In the warmer orchid houses, less air is required as the temperature would be made too low if the house was over-ventilated. Definite rules are difficult to state, but one of the most important is that draughts should be avoided as they can cause more damage than under-ventilating. The use of top ventilators in the greenhouse roof must depend on the direction of the wind and its force. They should be opened just a little at first and the opening gradually increased if the temperature rises. Considerable amounts of moisture will be lost if these vents are open for too long. In a small greenhouse which heats up very quickly, the vents must be opened widely and frequent damping down will be necessary to counteract the moisture loss. Conservation of moisture is most important until the autumn when more air can be admitted to ensure ripening of the plants. The bottom ventilators on the lower sides of the house can be used more frequently, especially if the heating pipes are under the staging. The air entering from these vents is warmed as it passes over the pipes. In the cool and intermediate sections these vents can be left open at night when it is not too cold, and with the cymbidiums a little ventilation can be used on all but the coldest days. If both top and bottom ventilators are to be open at the same time they should be open on the leeward side, which will reduce direct air currents. Usually it is best to open one set of vents only, the top being open when the bottom is closed and vice versa. If the house has ventilators in the glass sides these should not be used as too much moisture would be removed and draughts would be caused. In general, air should be admitted whenever possible in both summer and winter provided that excessive moisture and temperature losses are avoided and droughts are not allowed to develop. Light and shade Orchids, in general, require plenty of light but not the direct rays of the sun, especially during late spring and summer. Some provision for shading will be required. The application of a shading paint such as ‘Summer Cloud’ can provide the right density of shading and is easy to apply, but it is more or less permanent until it is removed and it thus provides shade on dull days when it is required less, as well as on bright days. If the permanent shading is to be used it should be in position by the end of March or a little later if conditions are dull. The only really efficient method is to fit movable blinds. These can be of the slatted-wood type or of one of the plastic types such as `Tygan’. Light canvas can be used but does not give such long service. An air space between the glass and blinds is essential as this helps to keep a more equable temperature in the house by allowing a free circulation of air over the glass. Blinds other than the wood-slat type, if kept flat on the glass, can cause considerable heating of the glass and hence of the air in the house. Blinds can be usefully lowered in the winter on very cold nights and perhaps even on the very coldest days when an east wind is blowing, as they give some protection. Blinds have the great advantage of control; early morning and late evening light can be allowed to reach the plants to their great benefit. On days which are expected to be bright they can be lowered before you leave the house and raised again in the evening. On bright days from May onwards, blinds can be down from about 8 am to 6 pm GMT. Spring days demand the most caution in the use of blinds when many tender young growths are present on the plants which can very easily be scorched. As the late summer progresses into autumn more light should be admitted; a gradual increase helps to ripen the bulbs and makes the plants generally firm. Cattleyas, cymbidiums and especially dendrobiums require abundant light to make them flower, while types such as paphiopedilums and masdevallias are definitely shade-loving. Slat blinds if used for the latter do not provide the correct density of shade, and hence a very light application of shading such as ‘Summer Cloud’ to the glass will be needed. The blinds can be lowered on the brightest days. This extra shading is also useful as a precaution against damage should the main blinds be overlooked. In large towns heavy fog causes a dark deposit on the glass in winter. This should be washed off, as orchids need all available light at this season. Feeding The feeding of orchids is a controversial matter and the beginner is advised not to feed orchids at the start. Plants grown in osmunda composts generally have enough nutriment provided as this material breaks down slowly. The various tree bark composts are said to be short of some plant foods, so weak applications of a liquid manure can be given. Some of the terrestrial types benefit from the addition of old cow manure to the compost. Examples include the deciduous calanthes, thunia, lycaste and phaius. Cymbidiums and paphiopedilums, as well as the genera mentioned, can take regular applications of weak liquid feeds. If the plants are to be fed, the weakest solution should always be used and then only during the growing season and on plants with a full rooting system. The more feeding a plant receives the more light is necessary. As the British climate does not always provide sufficient light for the ripening of growths, these frequently become soft when they are fed, and then disease troubles develop and the plants do not produce their usual number of flowers. Temperatures The temperatures for the various sections must be regarded as being average only. During bright spells temperatures may often rise well above the stated maximum. In winter the day temperatures should not be made higher by forcing the heating system. Warm section In summer a temperature of about 70°F (21°C) by night and 70-80°F (21-27°C) by day, higher during bright spells. In winter 65°F (18°C) by night and 70°F (21°C) by day. Intermediate section In summer a temperature of about 65°F (18°C) by night and 65-70°F (18-21°C) by day, higher during bright spells. In winter 55-60°F (13-16°C) by night and 60-65°F (16-18°C) by day. Cool section In summer as near as possible to a temperature of 60°F (16°C) by night and day. In winter by night down to about a temperature of 50°F (10°C) and 55-60°F (13-16°C) by day. Cymbidiums prefer a winter night temperature minimum of 50°F (10°C); this can drop occasionally in very cold spells to 45°F (7°C). By day 50-55°F (10-13°C). In summer by night a temperature as near 50-55°F (10-13°C) as possible and 55-60°F (13-16°C) by day; this can rise to about 70°F (21°C) on bright days. least root and top growth activity, usually in the winter, and the degree of rest varies considerably in this family of widely differing vegetative types. This makes it impossible to lay down hard and fast rules. In one genus, for example, the species vary one from the other in their requirements. The resting period often corresponds to the dry and either hot or cool period of the plant’s native climate. The ideal method for resting orchids is to have a resting house or section, but with a small mixed collection grown under one roof. There is always a cooler end to a greenhouse and this can be used to advantage by placing the resting plants at this end. 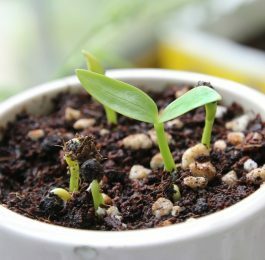 Plants without pseudobulbs or tubers must not be rested as they are always active to some extent, and they do not have the food and moisture storage facilities provided by these parts of the plant. Examples of this type include the slipper orchid, paphiopedilum, and the masdevallias. Vandas and aerides and similar types, which have a continuously upward growing stem often have thick fleshy leaves, which in nature are able to resist drought. These plants should receive just enough water to keep fresh the sphagnum moss on the compost surface. In general, all young unflowered seedlings should be watered at all seasons with due consideration given to the weather. Other orchids with pseudo-bulbs or tubers require a rest in the winter—generally, the harder the bulb or leaf the longer and drier the rest. Those types that are deciduous or semi-deciduous require a more pronounced rest, for example, in the genus Dendrobium the D. nobile and D. wardianum types will take a longer rest than the evergreen types such as D. thrysifolium. Most cattleyas and laelias and their hybrids need several weeks rest after flowering. Always keep a look out for shriveling of the pseudobulbs; a little can be tolerated but this should never be so extreme as to affect the leading pseudobulb. Odontoglossums need not be rested in the same way as cattleyas, moisture should always be present to some extent, except for very short periods. A house containing a small mixed collection will normally have a lower winter temperature and this will help to provide the natural conditions for resting. Attention must mainly be given to the frequency of watering. Careful observation of the individual plant will be the only rule. Failure to rest may induce weak, soft, winter growths, which is always a setback for the plant and it subsequently takes a long time to regain its former vigor. While reducing the moisture in the greenhouse as a standard winter practice, extreme conditions should be avoided because an excess of dry heat can produce undue shriveling of the pseudobulbs. Propagation The raising of new orchid hybrids from seed is a highly specialized procedure performed under laboratory conditions. The seed is sown on an agar jelly medium containing various mineral salts and sugars. Seed, glassware and implements are sterilized, as aseptic conditions are essential. After germination, which takes a minimum of three weeks and may last many months, the seedlings are usually placed on to a fresh agar jelly, again under sterile conditions. After about six months to a year the seedlings are transferred to community pots of standard potting compost and placed in the open greenhouse. Propagation by division is the only method of increasing choice varieties. Paphiopedilums can be split at potting time, making sure that each new piece has several growths including a leading growth. Cattleyas are best treated by severing the rhizome behind the fourth or fifth bulb from the front some months before the plant is to be repotted. A bud on the base of the bulb on the older portion may break into growth, eventually forming a new shoot. These pieces can be potted up separately. 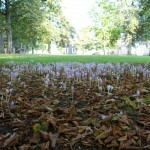 Back bulbs of most orchids can be induced to produce new shoots either as single bulbs or in clusters of two or three. Place these in the warmest place, in a pot partly full of crocks and topped with sphagnum moss. Dendrobiums of the nobile section often produce fresh plantlets near the top of old pseudobulbs. These can be taken off with a sharp knife when they have made a few small roots and potted up in the smallest pot available, in pure sphagnum moss. Old back bulbs can be cut up into small pieces of about 5cm (2in) and inserted around the edge of pots filled with moss or sand and peat. Large plants of many orchids have several leading growths and if these are cut up into pieces with the correct number of bulbs per growth, as many new plants will be formed. Duplication of fine varieties is always advisable against possible loss by accident, but before deciding to break up a large healthy plant the value of such a specimen should be considered. Such plants are very attractive and may receive more attention at shows. A small propagating frame in the greenhouse greatly facilitates the establishment of plants from bulb divisions and at the same time provides a home for small-growing orchids that require extra warmth. always be carefully inspected, especially imported plants. Slugs and snails have a taste for fresh young orchid growths as well as roots and flowers. Good control can be effected with Slugit used either as a spray or as pellets which can be placed on the benches around the pots. Diseases are in general uncommon in orchids. Good healthy plants which have been grown under well-aired conditions are seldom attacked. An occasional plant may succumb to a black rot disease. Diseased parts can be carefully cut away and powdered sulphur applied to the cut surface. If caught in time these rots can be controlled but very badly infected plants are best destroyed. Virus disease is the one exception. This appears especially in cymbidiums as yellowish streaks or ringed areas which eventually turn blackish. New propagation techniques will ensure that only healthy plants are distributed, while infected plants are best burnt. Control of red spider mites and other sucking insects such as greenfly will reduce the risk of virus spread. Potting composts For many years the standard ingredients of orchid potting composts have been osmunda fiber which is the chopped-up root system of the royal fern (Osmunda regalis) and the bog moss known as sphagnum moss. Osmunda fiber is somewhat expensive as it is imported from Italy and a finer grade from Japan. 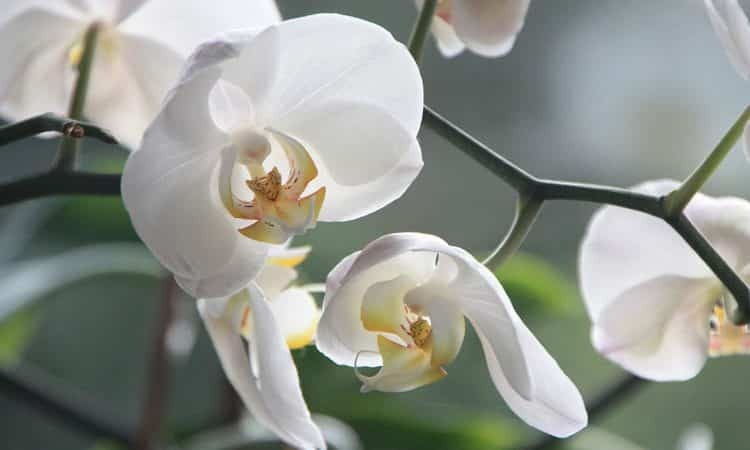 Though it requires some skill in its use, its long-lasting properties and ability to provide enough food as it breaks down makes it an ideal medium for growing orchids. The beginner would be well advised to gain experience in potting with osmunda fiber and wait until later before experial ready prepared and mixed with sphagnum moss for immediate use. This is often available by the bushel, which will make it possible to pot a large number of plants in 16cm (4in) pots. Larger amounts can be bought in the rough state in bales. The baled fibre should be pulled apart, chopped up and the dust sieved out. Selection of the rough and the finer fibers will provide material for those plants with either coarse fleshy roots or thin delicate roots. The prepared mixture should be neither wet nor completely dry but just moist. Prior to a potting session the potting compost should be placed in the greenhouse to keep it warm, as the use of cold material can do damage to the roots by chilling them. Many of the cultivated orchids are epiphytes, that is plants which grow on trees, deriving their nourishment from leafmould and other plant debris which accumulates around the roots and also from the air. They are perching plants only, and do not derive food from their host tree as do the parasitic plants. Many of the roots are freely suspended in the air and others cling to the bark or penetrate among the mosses which grow along the branches. The dividing line between the epiphytes and the other group known as the terrestrials is sometimes rather vague. The terrestrial type grows essentially in the soil or in the humus of forest floors. At one time it was the practice to use these two divisions as a guide for potting materials, using fiber and moss for the epiphytes, adding loam fiber to moss and fiber for the so-called terrestrials, such as the plain-leaved slipper orchids (paphiopedilums), cymbidiums and lycastes. The use of loam fiber is not so frequent nowadays, but if good material is available it does help to keep costs down by reducing the amount of osmunda required in the composts. osmunda compost feeding is not generally necessary. Other substitute or supplementary materials sometimes used are dry bracken fronds, which are said to be rich in potash. Some plastic fibers, which have the same consistency and thickness as osmunda fiber, when mixed with sphagnum moss give good results with feeding. Even pure sphagnum moss as a potting material has been very successfully used for some orchids. Bed cultivation of cymbidiums has come into favor and a recently recommended compost consists of equal parts of leafmould, dry bracken stems, coarse sand, sphagnum peat and old cow dung. This compost can also be used for pot cultivation. Potting procedure The best time to repot an orchid is generally in the spring or when root growth begins. The plants then have the summer in which to produce abundant roots and complete their growths. If possible potting should take place when the roots are just showing or at least when they are very short. A plant with long roots is not easy to deal with if damage is to be avoided. The shorter they are the less risk there is of breaking the naturally brittle roots. Potting time must depend on the individual plant, and its growth habits should be studied. Some cattleyas, for example, produce a growth which matures to flowering before roots are formed in abundance, and this is usually in mid summer. Odontoglossums can be potted in spring or in early autumn, at either season avoiding the warmer days when they are making roots. The slipper orchids can be potted after flowering in late winter provided this is done in warm conditions. In general, orchids need not be potted every year if the compost remains in a wholesome condition, firm and sweet. If the fingers can be readily pushed into the compost attention is needed. Every other year is a good rule for potting. Even then if the plant has enough room and only a small portion of the compost is soft, the bad part can be replaced with fresh compost, or the surface material can be removed if it is sour and broken down and a top dressing of new compost worked in. Orchids do not like decayed compost but they equally dislike too frequent disturbance and this fact should always be in mind when an orchid needs attention; it could be that a drastic treatment such as a complete stripping down of all the compost would prove fatal. Orchids should never be over-potted, rather they should be under-potted if the correct pot size cannot be used. With the exception of cymbidiums, phaius, Zygopetalum mackayi and some of the thick fleshy-rooted types which require ample room to grow, the smallest pot should be chosen. Three-quarter pots or pans are preferable for most types. For those with rambling stems or the pendant or ascending varieties, rafts or baskets would be more suitable. Baskets with widely spaced spars are essential for the stanhopeas which send their spikes downwards, the flowers appearing beneath the container. The plant to be repotted should be lifted out of its old pot by inserting a potting stick at the back of the plant and gently levering the plant upwards. Where the roots are adhering tightly to the outer surface of the pot less damage can be caused by cracking the pot with a sharp blow. The new pot should be amply crocked from a third to a half of its depth, depending on type, with pieces of broken pot inserted vertically over the drainage hole. Perfect drainage is essential for orchids. 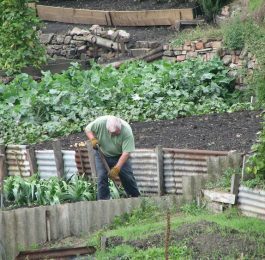 The plant should be prepared by holding it firmly in the left hand, and with a potting stick in the right hand carefully remove downwards all the old soft compost, leaving that which is still sound, especially at the front. Old decayed roots should be cut away to the rhizome and any old soft, brown bulb cut off. This will often allow the plant to be replaced in the same-sized pot. In general, about 4 or 5 bulbs and the new growth should form the plant to be potted, again depending on the individual plant and its vigor. The back part of the plant, that is the oldest bulb, should be placed at the rim of the new pot, allowing about 5cm (2in) in front of the leading growth for future development. A small quantity of compost should be placed over the crocks and selected wads of compost carefully placed about the roots of the plant ensuring a good base beneath the rhizome. Insert the plant into its new pot and carefully work in new compost, starting at the back of the plant and keeping the rhizome level with the top of the pot.The fingers of the right hand should work through the heap of compost, selecting wads of fibers and attempting to gather these so that the wad has the fibers running up and down. This wad should be pressed with a potting stick inwards towards the plant and at the same time slightly downwards. This should continue with the lower level and then with the top layer until the compost level is just below the pot rim. Attention should be given to the inward levering of the compost towards the plant, as any excessive downward pressure can make a caked-hard mass, resulting in impeded drainage. A test for the correct firmness of potting is to pick up the potted plant by the leaves or the bulbs which should not part from the pot. The completed surface can be given a trim with shears. As with all practical matters a demonstration by an expert is the ideal way to learn this essentially simple procedure and such a demonstration can be seen at many orchid nurseries. Stake the freshly potted plant if necessary and keep it in a shadier place than is usual for the type for some weeks. Attention to the cutting of the osmunda fiber when making up the compost makes for easier potting. 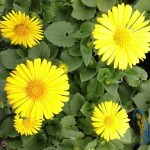 It is cut finer for small plants and left in larger pieces if large plants are to be potted. Watering and damping The watering orchids is perhaps the most difficult cultivation procedure for the beginner to understand. Judgement and care must be used. This applies to any pot plant, but orchids do have their special needs. A carefully watered orchid collection can be left for a short time with no ill effect, provided you look after ventilation and shading. Although other plants left for the same time would not be able to withstand the lack of water, this is one of the many advantages in growing orchids. Rain-water is always preferable to tap water and a rainwater tank for storage, placed in the house will ensure that the water temperature will be near to that of the house in cold weather. Mains water if it is non-alkaline can be used in some districts. Cold water should never be used. Water well when watering at all; sufficient should be given to wet the whole of the compost. Never water a wet plant. The timing between waterings will depend on many factors such as the type of orchid, the weather and the temperature. Overwatering is without doubt the main cause of unsuccessful cultivation, the waterlogged compost excludes the air that is so important to the orchid roots. Many beginners take this advice to the extreme and let their plants become tinder dry. This can be equally disastrous except when the type requires a hard dry rest to encourage flowering. This rest is given in the winter. If drainage is correctly provided and the compost is not too tightly packed and hence of the right porosity, there is less danger of overwatering. Perhaps the main cause of damage is too frequent watering. This applies especially when the plants are not in full growth, either early or late in the season and in the winter and also in dull weather when drying out of the compost is not so pronounced. Each plant should be treated as an individual. All of one type may not need the same treatment, but it is an advantage to stage their growth, together, when one can be compared to another, thereby gaining experience. A watering can with a fine spout is ideal as the amount coming out can be easily controlled when watering plants on the benches. Plants in hanging pots tend to dry out and those in baskets even more so, as they are near glass. They should be immersed in a bucket of water to just over the pot rim. growing season. Recently repotted plants require much less water and are best grouped together at the shadier end of the house. Signs of their need for water are difficult to observe, but if there is any doubt it is best not to water the plant until the following day or when the next general watering takes place. Live sphagnum moss on the compost surface becomes yellowish when dry and this can be used as a guide that water is required. Lifting the pots (a wet one is obviously heavier than a dry one) does give some indication, especially if this is coupled with feeling the texture of the compost. Another test sometimes used is to pour a very little water on to the compost and if this soaks in readily the plant receives no further water. Tapping of the pots as practised with other plants in loam compost is not recommended, as it is both deceptive and unreliable. Damping This is the process of spraying the floors, walls and stages of the orchid house to increase the atmospheric humidity which is so necessary for the continued health of the plants. Greenhouses vary considerably, one being naturally dry and another moist, but as a general rule damping should be done two or three times a day according to the weather and time of the year, more damping being needed on hot dry days and none on the coldest days. Damping is best carried out when the temperature is rising and not when it is falling. Ordinary tap water can be used so as to conserve rain water supplies. Special care is needed in the autumn during dull mild spells when little heating is being used; the atmosphere can become excessively moist at these times. In winter the greenhouse atmosphere will often become dry due to the greater heat in use. Damping should then be increased slightly but only if the temperature is to be maintained, as any marked decrease in temperature would result in over-moist conditions.